Today is Trinity Sunday--the day when Christians all over the world celebrate the tri-unity of God. The Christian doctrine of the Trinity is easily one of the most mysterious, and least understood Christian doctrines. 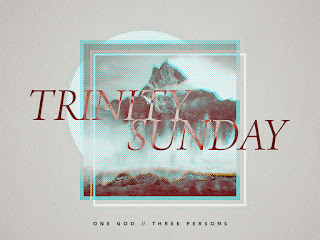 The pat Christian-y answer to someone who doesn't understand the Trinity is simply, "God is three-in-one... One God, three persons." Sometimes people try to explain how God is three-in-one by using water as an illustration. "Water," they say "can be ice, vapor or liquid... but it's still water." Or they'll show an egg and explain that there's a shell, a white and the yellow center, but the thing is still an egg. For the life of me, I don't know how that one works, exactly. But still, it's still widely used. The fact of the matter is that the doctrine of the Trinity is hard to understand and even harder to describe. None of our feeble words seem to really do it justice. Father... Son... Spirit.... this is the way the Church has come to understand the tri-unity of God. And for a lot of people, this seems strange. Many non-Christians struggle with this understanding of God, and Christians don't do a very good job of explaining it. After all, it is mysterious and odd. The fact of the matter is that Christians muddle up this whole Trinity thing pretty well---even with our best words and images. You can have what's behind Door Number One: God is a heavenly board of directors made up of three equal partners. God is in charge of production, Jesus is in charge of sales and the Holy Spirit is in charge of customer service. You can have what's behind Door Number Two: God is a committee or a board with one big boss and two subordinates. Most Christians tend to commit this heresy on some level. 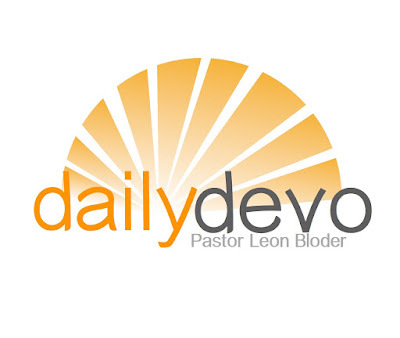 You can have what's behind Door Number Three: God is like three members of a team sitting on the bench and waiting to get into the game when they are needed. This one is my favorite---"put me in coach!" You can have what's behind Door Number Four: God wears three hats and puts on whatever hat is needed at the moment. I wonder what the Jesus-hat looks like? And is the Holy Spirit hat... invisible? At this point, you are probably saying, "Why does any of this matter?" "What is so important about any of this stuff?" What if I told you that Trinity is embedded in everything? And what if I told you that you already knew that? That's why I like the way some of the ancient church fathers and mothers described the relationship of the Trinity as a perichoresis. This Greek word paints a vivid picture of the "persons" of the Three dancing around in harmonious joyful freedom. I think that the Orthodox Christians might give us a clue about how it could look. In a lot of ancient Orthodox art, the Trinity is depicted as sitting down at a meal together. 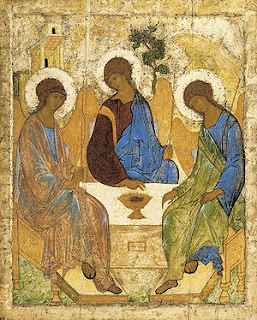 You can see what this looks like in this classic Orthodox piece of art by the 15th-century artist Andrei Rublev entitled "The Holy Trinity." God is depicted in gold, the Son in blue and the Holy Spirit in green. Some art historians believe that the little box in the front originally contained a mirror. So if you were staring at the painting, you would soon see yourself depicted at the table with the Trinity. The three created room for a fourth... you. We find in the Trinity a way of knowing who we are and what we are called to do. Let's take a look at Scripture for a moment at two wonderful passages where the Trinity is present and accounted for in all three "persons." This passage is, of course, the scene at the baptism of Jesus when you can see all three "persons" of the Trinity on display. The Son is in obedience and loving submission to the Father, the Father delights in the Son, and the Holy Spirit seems to be the creative energy at work in this triune relationship. 20 But you, dear friends, by building yourselves up in your most holy faith and praying in the Holy Spirit,21 keep yourselves in God’s love as you wait for the mercy of our Lord Jesus Christ to bring you to eternal life. By the time Jude is written, Christians have been at this for a while and have developed some ideas about the doctrine of the Trinity--even if they weren't expressly referring to it as "the Trinity"
And these ancient Christians were on to something. Because they were picking up on a fundamental truth about the world around them, and about the God who was in all and through all that world. I believe that there is a deep and abiding knowledge of the Trinity that is imbedded in all of Creation, including us. The Bible calls this kind of knowledge ginosko---the kind of knowledge that you feel in your gut. How do I know this? Well, it begins with the number 3. What's up with the number 3? Is it really a magic number? As it turns out... yes, it is. Greeks used the Triad in their beliefs (3 Fates, 3 Furies, etc.). It was a defining characteristic in Celtic religions. The Triad is the oldest of Indian symbols. Triads have been found in the Temple of Heaven in China. The Standard Model of fundamental particles includes three generations of matter. Baryons - these tiny little building blocks of atoms and stuff, are made up of three quarks---which are even smaller. We also perceive our universe in three spatial dimensions. 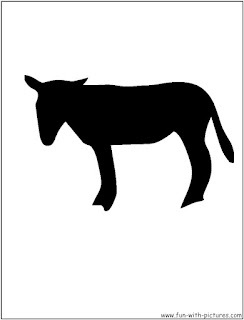 The number 3 is used to mediate between two opposing or contradictory values. Once something has been done three times it is considered permanent because we are connected to it, and we connected it to this world. The Amida is prayed 3 times a day---this is the prayer that many believe is what Jesus loosely based The Lord's Prayer upon. There are 3 people standing when The Torah is Read. The number 3 connects the dichotomy of two and shows a common purpose. in other words, if you have two lines going in opposite directions a third line can connect them and form a triangle. When 3 bricks are stacked upon one another it becomes a pattern, until that time, it's nothing. When there are two links in a chain that is joined by a third, the links on the outside are not touching, but are part of the whole. It becomes something new but not disconnected. Three represents unity---which is the 13th rule of Ishmael for the Torah. 3 Year cycle of reading the Torah. And for some of us--we started getting this at an early age when we realized from Schoolhouse Rock that 3... well, it was a magic number. You know that brings back memories, am I right? You see, what we need is not a way to explain the Trinity, but a way to re-imagine it, a way that helps us understand it without losing the mystery. Theologian Richard Rohr's book entitled "The Divine Dance" is probably one of the best books I've ever read on the subject of the Trinity. It may be one of the best books I've ever read, period. Because I’m convinced that beneath the ugly manifestations of our present evils—political corruption, ecological devastation, warring against one another, hating each other based on race, gender, religion, or sexual orientation—the greatest dis-ease facing humanity right now is our profound and painful sense of disconnection. In other words, we love to create dichotomies. Why do you think cable news is full of talking heads squaring off over both sides of an issue. This is how we think. We either rely on rugged individualism as one, or the forced dichotomies of two. But when we embrace the notion of the Three--it changes everything. The principle of three is inherently moving, dynamic, and generative. We see this throughout all creation---but not so dramatically as we see it present in the Trinity. 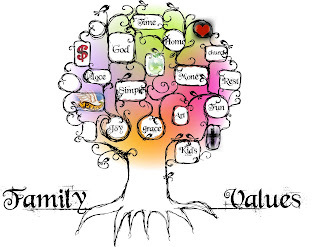 The Trinity is the unity of a community of persons who love each other and live together in harmony. Each exists only in this relationship, but not apart from it. And that's what makes this an awesome way of thinking about how God is three-in-one. Because the unity of God is personal, experiential and intimate and not merely mathematical. Which has some fantastic implications for you and me. Because deep down inside we know that the Trinity not only makes sense---it's essential to our very identity, redemption and calling. We find in the Trinity a way of knowing who we are, and what we are called to do. And who are you in God? And what are you called to do? 1. You are meant to move toward a relationship with God. This is personal. You are given a personal invitation to join in the Divine Dance. You have an identity that is formed and informed by your relationship with God through Jesus by the power of the Holy Spirit. You are God's dance partner. So live like it. Stop holding back. So what if you have a past? So what if you feel inadequate? Get out on the dance floor and move. 2. You are called to live in dynamic community. You are not alone. God did not leave you isolated in eternity, apart from him, lost and lonely. God the Son became one of us to save all of us and to teach us by his example what it means to live selflessly for others. God the Son also established the Church, because He wanted his followers to be together. So let the dance party spread! And by "dynamic" I mean life-changing and transformative. What small groups are you a part of? If you aren't part of any, what are the excuses you've been giving as to why you haven't connected? Too busy? Not enough Bible knowledge? Not good enough? Well, how do you expect to learn and grow if you aren't doing anything dynamic? 3. You are called to live in life-giving ways--to give yourself away for the sake of the world. The Trinity encourages us, guides us, cajoles us, inspires us and convicts us regarding how we should live. And what we are called to do is to give ourselves away in the same kind of selfless way that God gave Godself away. Stop thinking small. Stop living small. When it comes to taking God's great big dance party out into the world, there's no wrong way to do it--unless you limit it, and reduce it to terms of one or two. Learn to live in terms of the three. Three... it's a magic number. Yes it is.